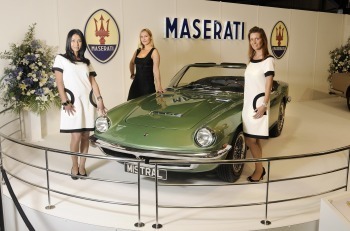 Away from the thrilling on-track action, Maserati exhibited in the Earls Court Motorshow, recreating the glamour of an authentic 1960s show. A stunning Maserati Mistral Spyder alongside a Quattroporte (Mk I) wowed the spectators, whilst they were offered a tantalising glimpse of Maserati’s “cars of the future” in the form of the GranTurismo S Automatic and Quattroporte Sport GTS that flanked their 1960s counterparts. On Sunday 150 clients were treated to sumptuous hospitality at Goodwood House, where Maserati GB hosted its annual Goodwood Revival lunch. The spectacular display on the lawn in front of Goodwood House featured the complete Maserati range: the Quattroporte, Quattroporte S and Quattroporte Sport GTS alongside the GranTurismo, GranTurismo S Automatic and the GranTurismo S.
Mr Andrea Antonnicola, Managing Director of Maserati GB, officially announced the arrival of the Maserati GranCabrio, which will be unveiled to clients in a private preview in London on October 1st ahead of its on sale UK estimated date of March 15, 2010. He subsequently announced the winners of the Maserati competition: Ms Kate Christie won the “Best Dressed Lady” award, presented by Adler of Bond Street. Ms Brenda Laguna, Marketing Director of Adler, was delighted to present Ms Christie with a stunning Chameleon ring, an 18kt gold ring and pave set with blue sapphires, whilst Ms Grace Fodor of Jemma Kidd make-up presented Ms Julia Dempster with a goodie bag of Jemma Kidd products for the “Best Make-Up”.